It was 40 years today that Australian TV (finally…!) began to colour our world. The wait for colour was a long one for Australia. The United States and Canada made the transition to colour by the mid-1960s, and the United Kingdom started the conversion to colour TV from 1967. Many European countries followed in 1968. Even New Zealand viewers were able to see Queen Elizabeth II open the Sydney Opera House in colour in October 1973. But for much of the 1960s and early 1970s, Australians were left with just speculation as to when colour TV might finally arrive. 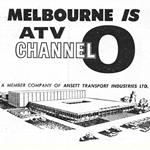 Some tentative steps were made in 1964 when ATV0, the channel that had just launched in Melbourne, had conducted some experimental colour transmissions prior to receiving permission from the broadcasting authorities. The tests consisted of a colour test pattern for durations of between five and fifteen minutes in the early hours of the morning on an almost daily basis for about three months. The channel was keen to experiment with colour, in particular because films and many imported shows from the US had started to be made in colour. 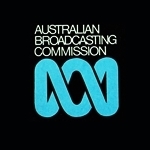 The Australian Broadcasting Control Board (ABCB) then ruled that no further transmissions were to take place pending the formation of standards for colour television in Australia. ATV0 and the ABCB did eventually agree on a trial of colour television. In June 1967 the station covered a country horse racing event in colour — making it the first “live” colour program on Australian TV. The colour broadcast was not transmitted to the public but was able to be viewed on closed circuit monitors located at the ATV0 studios in Nunawading. Station executives, government representatives and members of the press were invited to view the colour pictures. Canberra station CTC7 also displayed colour television in a shopping centre demonstration over ten days in September 1969. ABC had already started filming major sporting events and some documentaries in colour for archival purposes and potential export. The Government, however, was maintaining its slow and steady approach — with Postmaster-General Alan Hulme insisting that the transition to colour was not going to be a rush job, taking into account the long term investment by government, industry and viewers on new equipment. ATV0 then embarked on what was the largest colour TV project to date — covering the Australian tour of the Billy Graham Crusade. 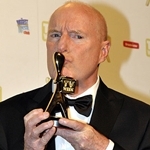 ATV0, in association with Glen Warren Productions of North America, produced four one-hour programs from Graham’s Melbourne appearances which would be syndicated to 600 stations, covering approximately 50 million viewers, across the United States. More than $1 million of equipment was freighted to Australia for the production, including cameras on loan from a Canadian TV station, CFTO9. 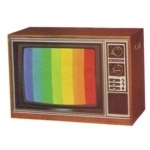 In February 1969, the Federal Government announced that after years of consideration — and fierce lobbying by equipment manufacturers from all sides — Australia would adopt the German PAL colour TV standard as opposed to the American NTSC and French SECAM systems. PAL was found to provide a better quality and definition of picture and was compatible with both VHF and UHF bands — although at that time television in Australia was exclusively VHF. Engineers also found that PAL was better suited to rugged terrain areas like those in many Australian cities and country areas. PAL had also been adopted in the United Kingdom and various other European countries. Although the PAL system had been chosen, government and industry still had another 18 months or so ahead of them for testing and to settle on specific Australian standards — and with the Government’s commitment that manufacturers would get at least 18 months between the announcement of a conversion date and the date itself, Australians looked set to get colour TV possibly by around 1973. But even though Australia was still waiting on a conversion date, independent production companies had already taken steps towards ongoing colour production. 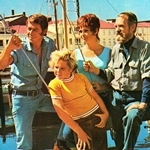 Programs like Skippy, Barrier Reef and The Rovers (pictured) in the 1960s and Homicide, Ryan, Boney and Spyforce from the early 1970s, all produced on film, were being made in colour in advance of the colour TV conversion, with a view to potential sales to countries where colour was already in place. Three years after the government decided on adopting the PAL standard, Prime Minister William McMahon finally announced on 15 February 1972 that Australian TV would be switching to full-time colour transmission from Saturday 1 March 1975 — “C-Day”. 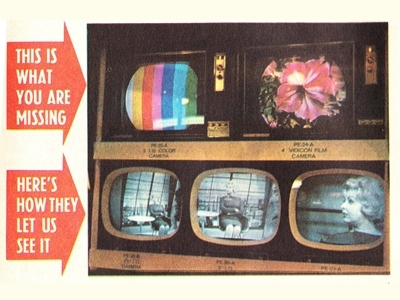 The announcement came with predictions that colour TV sets would likely retail for around $700 (in 1972 dollars). The conversion was predicted to cost ABC around $46 million over six years with the commercial sector expected to spend around $70 million to upgrade studios and transmitters — although some stations had already invested in colour-based equipment. A spokesperson for Sydney’s ATN7 said in 1972 that the station already had a colour-ready transmitter plus videotape machines that were colour compatible. ATN had expected its overall conversion bill to be no more than $700,000. Melbourne’s HSV7 had already converted its transmitter for colour by 1972 and was ready to commence the phase-in of colour production. 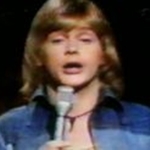 In March 1972, GTV9 produced a special series, International Opportunity Knocks, a talent quest to find an Australian contestant to compete in the long-running UK series, Opportunity Knocks. The contest final was produced at the GTV9 studios in colour and broadcast in the UK a few days later. With over 130 transmitters scattered across the country, ABC in 1972 expected that it would have capital city studios and equipment such as videotape machines, microwave links and transmitters all converted for colour by 1 March 1975. The roll-out of colour conversion to regional sites was then expected to take a further three years. By 1974 colour conversion was in full swing with capital city stations making the final conversions to studio equipment and commencing regular colour TV production. 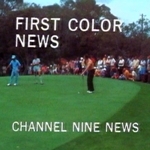 The Federation of Australian Commercial Television Stations (FACTS) had proposed that the Government bring forward the conversion date to 1 July 1974 but this was denied — with the Broadcasting Control Board maintaining that test transmissions in colour would be allowed to commence in October 1974 with C-Day still to be on 1 March 1975. 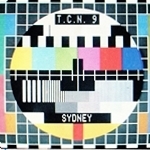 Monday, 7 October 1974, saw the commencement of regular colour test pattern transmission (such as TCN9’s, pictured). This was at first limited to only a maximum of a couple of hours a day, to enable broadcasters the opportunity to fine tune or test their equipment and for TV retailers to put colour TV sets on display. Two weeks later, 19 October 1974, saw the colour tests expanded to allow sports coverage — but still limited to only a couple of hours a day to a maximum of four hours a week. Hence, viewers could be watching a tennis match or golf or the afternoon horse racing but only be able to see a portion of it in colour. The tests were later expanded to allow full sports coverage plus other program material in colour such as news bulletins, special events, movies and selected episodes of general programming. ABC’s new pop music show, Countdown, made its debut in November as a half-hour show on a Friday night — produced and broadcast in colour. ATV0’s annual telethon for the Nerve Deafness foundation was renamed Colorthon, with six of its scheduled 26-and-a-half hours broadcast in colour. Viewers were treated to colour broadcasts of the Showcase talent quest finals and the Miss Australia Quest. Christmas saw Carols By Candlelight and Bobby Limb’s Sound Of Christmas broadcast in colour, as well as the ABC’s via satellite coverage of the opening ceremony of the Holy Year, followed by midnight mass from the Vatican. The changeover period also saw networks ramp up their promotional efforts. ABC had ‘tweaked’ its logo to be bolder and to incorporate colour designs, and also unveiled some cheeky new station idents. Finally, after months of test transmission, C-Day finally arrived on 1 March 1975. 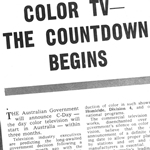 The week leading up to the final changeover saw networks imposed a restriction that no prime time programming was to be in colour until C-Day, but daytime tests were still allowed. The sketch was then followed by a one-hour edition of Countdown, introduced by Johnny Farnham (pictured) and featuring an all-Australian line-up of performances. ABC’s special overnight transmission continued with an episode of the British series Monty Python’s Flying Circus followed by a replay of a world championship tennis match from 1973. ABC’s C-Day daytime line-up included special children’s programs and seven hours of sports coverage. Prime time was highlighted by the variety special Colour It Music from the Sydney Opera House and including performances by Cleo Laine and John Dankworth, the Australian Ballet, Claire Poole Singers, Judy Stone, Darryl Braithwaite, Sydney Symphony Orchestra and Melbourne Symphony Orchestra. Later in the evening the half-hour special The ABC Of It looked at 24 hours in the life of the ABC, encompassing radio and television operations as well as crosses to international bureaus in London, Tokyo, Jakarta and New York. Even though the ABC had proposed a three-year schedule to roll-out colour transmission to all regional sites, it had managed to complete the transition by 1976. Only three commercial stations were reported to have missed the C-Day deadline — the most significant being NTD8, Darwin, which was off the air for ten months following Cyclone Tracy destroying much of the city at Christmas, 1974. 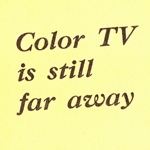 Earlier predictions that Australians would be slow in adopting colour TV, as had been the experience in the UK and US, were found to be way off the mark. 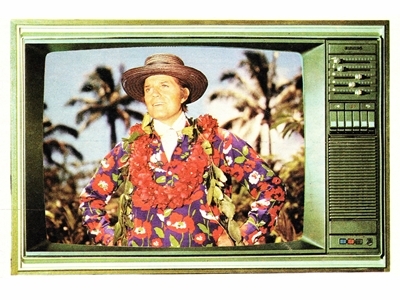 Approximately 2.5 per cent of homes were reported to have converted to colour TV in time for “C-Day”, but by July 1976 an estimated 17 per cent of households had made the switch. This number would shoot up to 60 per cent by the end of 1977. 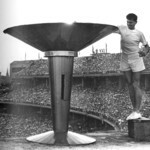 Australia went on to complete one of the fastest changeovers to colour TV anywhere in the world. But early adopters of colour TV were warned about buying a set that may not allow for future requirements — in particular the advent of UHF television in Australia which was due to occur anytime from the late 1970s. Early colour sets had either VHF-only (Channels 0 to 11) controls or dual VHF-UHF tuners. The policy was that after 1976 all colour TV tuners sold in Australia were required to have both VHF and UHF capability, or at least the capacity to have a UHF tuner added. The advent of colour also marked a shift in the scheduling of re-runs. Black-and-white programs that had been circulating in re-runs were suddenly being frowned upon, and as a result short-sighted TV networks (around the world, not just in Australia) discarded swathes of black-and-white programs from their archives as they were deemed to not be of any further use or market value. Very few predicted the future potential for re-runs or merchandising — and nobody was to predict the development and growth of new technologies such as home video, pay TV and the internet that would breed an appetite for such classic material. 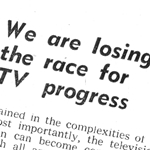 Source: TV Times, 13 January 1965. TV Times, 28 June 1967. Sydney Morning Herald, 19 May 1968. The Age, 28 February 1969. TV Times, 12 March 1969. 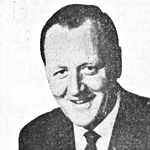 Canberra Times, 3 September 1969. TV Times, 26 February 1972. TV Times, 18 March 1972. 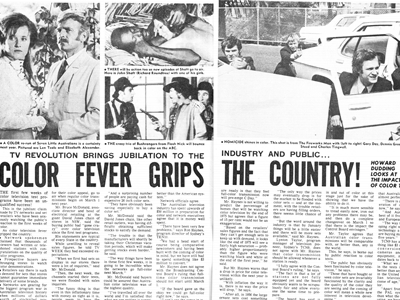 The Australian Women’s Weekly, 23 October 1974. TV Week, 14 December 1974. Choice, January 1975. TV Times, 22 February 1975. TV Week, 1 March 1975. Sydney Morning Herald, 19 July 1976. Canberra Times, 28 October 1977. Classic Australian TV. Terrific piece of writing and history. I remember seeing ‘colour tv’ at Melbourne’s Exhibition Buildings in the sixties, which I guess was just a hooked up monitor, and it looked awful with horribly garish colours. Thanks Andrew. Always good to hear people’s own recollections. I can imagine the brightness of colours was bumped up for maximum impact, but as you say probably had the opposite effect! The first colour broadcast in the United States was actually in the mid-1950s (1954 to be exact), not the mid-1960s. Colour television started to become more popular and affordable to most households in the mid-1960s. It was actually 1953 in the US with Japan following a couple of years later. Then again, there was one station in the United States that didn’t commence in colour until 1985 or 1986! Its name eludes me though. For the record, the little boy featured in the HSV demo clip for 1968, is none other than Jamie Redfern. He was either about to, or had already turned 11 years old(depending on whether the Royal Melbourne Show was held in March or April, or later in the year, either side of Jamie’s 9th April birthday). Jamie was introduced by Station HSV-Melbourne children’s personality, Happy Hammond and went on to perform “I’m Gonna Sit Right Down And Write Myself A Letter”. The intro for the HSV Royal Melbourne Show clip claimed Jamie was only 9 years old but the details were wrong. Jamie Redfern was born in Liverpool, England on 9th April, 1957. The very same clip is featured on the DVD “Young Talent Time Tells All” as an extra bonus feature. also on that DVD is the 1971 YTT team’s half-hour feature, “Caravan Holiday”, shot during the 1971/72 Xmas/New Year holiday break and was the last-ever appearance by veteran comedian Buster Fiddess, who played Mr. Crawley in the feature. Sadly he passed away after shooting for the feature was completed. “Caravan Holiday” was shown as a support feature in major cinemas to the Ryan O’Neil/Barbra Streisand comedy, “What’s Up Doc” and got its only TV airing on Station ATV-Melbourne near Xmas, 1972, likely also aired on Station TEN-Sydney. Thanks for that, Andrew B., the Newcastle Mattara festival was held originally first week of September, but is now held in the last week of the month, tying in with school holidays. Hi Andrew. You mean the larger, push button one? It was taken from The Australian Women’s Weekly’s colour TV supplement of October 1974. Thanks for sharing your links Andrew V. Some of those articles and ads I’d not seen before. The first colour TV set I owned(saved for and bought) was a His Master’s Voice(still being manufactured BY EMI[BY, not FOR]) “Braddon” 18-inch model with UHF tuner which, due to the lack of any stations in my region, Newcastle/Hunter, transmitting on that band, seized up and became unusable. NBN and ABHN were the only stations in the region at that time. ABHN was still transmitting on VHF Ch.5 but, within the year had been bumped up the band to VHF Ch.5a to make room for the impending arrival of 2NUR-FM, which started test broadcasts late in 1977 before officially opening on 17th March, 1978. That TV set would be one of the few Australian-made models of ANY brand, as Gough Whitlam, in April/May of 1975 signed a tariff reduction bill which comprehensively KILLED OFF our consumer electronics industry. And for that, Whitlam should be reviled, not honoured. 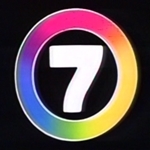 The comment that the Seven Network introduced the pictured Seven logo for the launch is partly true. It was not used for the colour launch in Melbourne by HSV7. 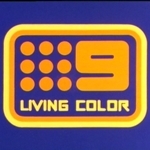 Seven Melbourne had its own unique logo “Seven Color Television” which did not include the numeral 7. 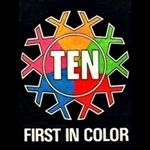 The network logo was not seen in Melbourne until September 1975 with the launch of a new slogan Seven Colors Your World, when the Seven Color Television concept finished. I remember seeing colour TVs in shops around October /November 1974 and especially our local Bashs shop in Wells Street in Frankston, Victoria. The 2 sets you have pictured are a 1981/83 Fujitsu General and the lower set with the pushbutton channel change is a Philips set (Made in Holland with a delta gun CRT) These were also in New Zealand in 1973 and the last of them sold was at the start of 1975. GTV9 in Melbourne used these as monitors around the TV station up until the 1980s. They were really reliable sets and the only thing that failed was the flyback transformer. They were also good fringe area sets and I`ve seen many in rural areas of Victoria and New South Wales receiving Melbourne and Sydney TV transmissions (Respectively) quite clearly. THe Fujitsu sets were sold to the SECV workers (State Electricity Commission of Victoria) at a heavily discounted price and proved to be very reliable sets with good RF sections having to receive Melbourne TV broadcasts on gigantic TV antennas which often cost as much as the sets themselves. Our family didn`t get colour TV till the Montreal Olympics in 1976 and it was a 53cm Rank Arena with an ultrasonic remote control and UHF/VHF touch channel change which cost my father $800. Prior to that was a 1963 Pye Pedigree which was only thrown out in the early 2000s and was still in working condition! Great article and I thoroughly enjoyed so a big thank you ! I know that NTD8 in Darwin missed the deadline as it was destroyed – does anyone know the other 2 stations to have missed the deadline? ITQ8 and BTW3 commenced colour transmission in May 1975, although in BTW3’s case their studio facilities were not converted to colour production until a couple of years later, so local programs like regional news were still put to air in black and white. NTD8 resumed transmission, in colour, in October 1975. What about BKN and STV? A couple of discrete points about colour tv pre 1975. * Indeed, in the 1960s, AWA made a colour transmitter for ATN-7 Sydney. I know who was involved in the construction of it. * The ABC did have colour equipment pre 1975 . The late Ron Wardrop was the first person to operate a Rank-Cintel colour telecine in time for the 1970 visit of His Holiness Pope Paul VI’s visit to Australia. * When I was a child in 1972, I was walking with my mother past DJ’s George St City Store (NOT THE MARKET ST STORE, DJs HAD ANOTHER STORE IN GEORGE ST) and in the display window was a colour television showing “Kimba The Lion”. It was obviously a pre-recording. Have no idea if the video was a u-matic. * It was a known fact that before colour tv day in 1975, when the ABCB prohibited full-time transmission, programs may have been transmitted in colour, Broadcasters had to switch off the colour burst signal which disabled any colour tv from displaying a colour picture. HOWEVER, there was a device called a chromalock which did not require the broadcaster’s colour burst signal. Thus the chromalock enabled people to view colour programs before the official colour day of 1-3-1975.